Singleton Sunray is an excellent Dufftown Single Malt, quite mellow and rich with delicate honeyed notes. Hallmark of Dufftown's intensity, this Single Malt is a mellow and classy expression. 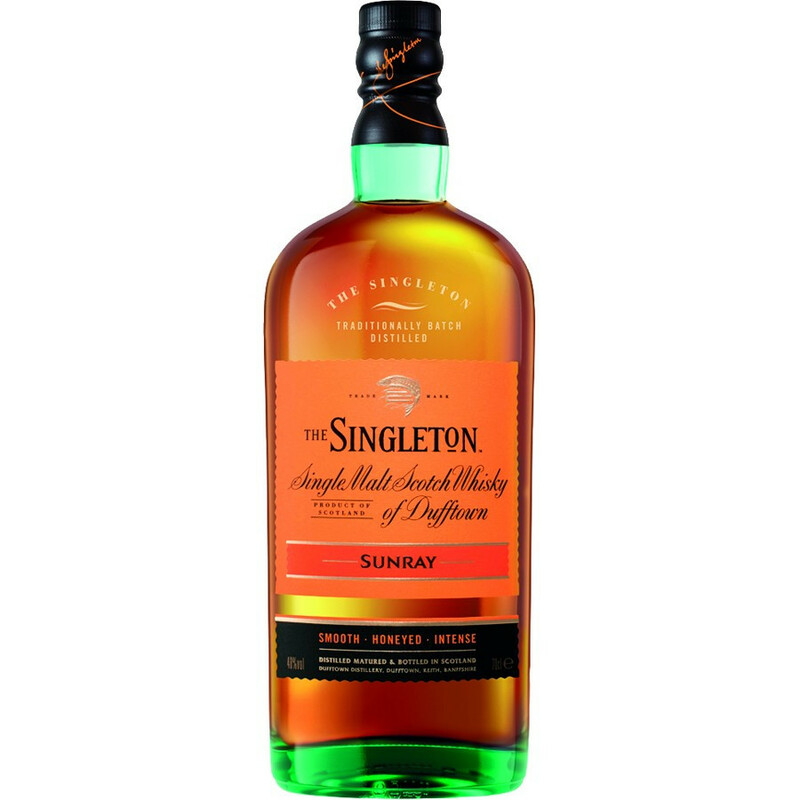 Singleton Sunray has aged in carefully selected toasted bourbon barrels that imparted rich honeyed notes to the whisky. With a soft chocolatey mouthfeel evoking praline-filled chocolate rochers, this Single Malt reveals a gourmet profile and fruity notes. « Perfectly balanced, Naturally Rich and Smooth » are words that describe perfectly this exceptional Single Malt. There is a saying in Dufftown: “Rome has been built on seven hills and Dufftown on seven distilleries”. The Dufftown distillery is the sixth established in town. Its buildings, genuine construction of the 19th century, are based closed to the river, in a small valley bordered with trees and hills. Germination on malting floors has been used until 1968. At the time, modern condensers were used to liquefy the vapours. The distillery started drawing water from the Highlandman John’s Well Spring from 1896 and is still using the same water. Dufftown distillery has three pairs of stills. Curiously, this whisky is described as “full-bodied” when freshly distilled but twelve years maturing in oak casks brings added smoothness and lovely warming notes. A major part of the whisky ages in American oak casks and a small quantity ages in European Sherry casks. These two flavours combined are the reason why The Singleton of Dufftown is so seducing and well-balanced. The uniquely shaped bottle of Singleton of Dufftown is inspired from traditional casks. The colour of the glass evokes the blue-coloured “lead glass” used at the end of the 19th century. Because of the unique character and quality of The Singleton of Dufftown whiskies, the distillery features in the Classic Malts Selection. Created more than 20 years ago, this selection recognises Single Malts crafted in the tradition of iconic distilleries, and offers the most impressive whisky styles Scotland has to offer. Nose: sweet, notes of Demerara sugar and baked apples right from the start, evolving towards heather honey. The fragrance of blackberries and blackcurrants brings a nice contrast to a malty, mellow body. Palate: mellow with spicy notes that mingle with the fruits. Finale: warm and sweet with notes of vanilla and redcurrant.